I have a lot of nuts in my house (no, not just Kurt and Ken); I mean the ones that grow on trees– walnuts, almonds, cashews, etc. I usually store them in my basement freezer, but even that’s getting crowded. I could bake some more treats, but we’ve had a lot of sweet things lying around the house– chocolate chip muffins, those homemade ice cream sandwiches, red velvet cake, King’s cake, etc. I even made a batch of the oatmeal currant spice cookies (I can’t resist the aroma and flavor of cardamom). So I went savory. My favorite preparation for cocktail nuts used to be the Barefoot Contessa recipe; however, Giada’s preparation leaves the Contessa’s in the dust. Walnuts, cashews and almonds coated with a sweet and spicy blend redolent of the flavors of Indian cuisine– curry powder, cardamom (yeah! ), cumin and garlic. The heat comes from additional cayenne, but it’s not overbearing. The preparation is a snap: coat the nuts in frothy egg whites, sprinkle in the sugar-spice blend, toss the nuts to coat well, then bake. You can find the recipe here. I use a baking sheet lined with my thin silicone mat instead of spraying with cooking oil. I also use my convection oven and periodically stir the nuts to break them up. I usually need closer to an hour than the 45 minutes in the recipe; you want to bake the nuts until the sugar caramelizes. Preheat the oven to 250 degrees (I use my convection oven). In a small bowl mix the sugar and spices. 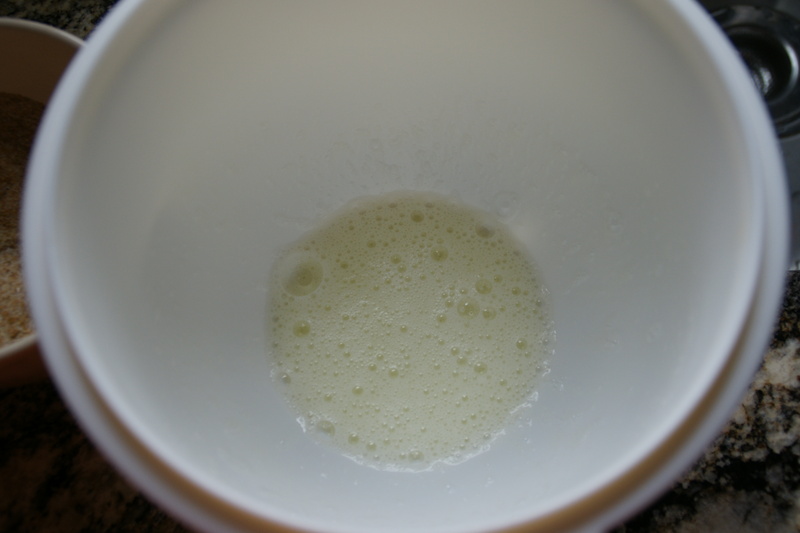 In a large bowl, whisk the egg whites until loose and foamy. 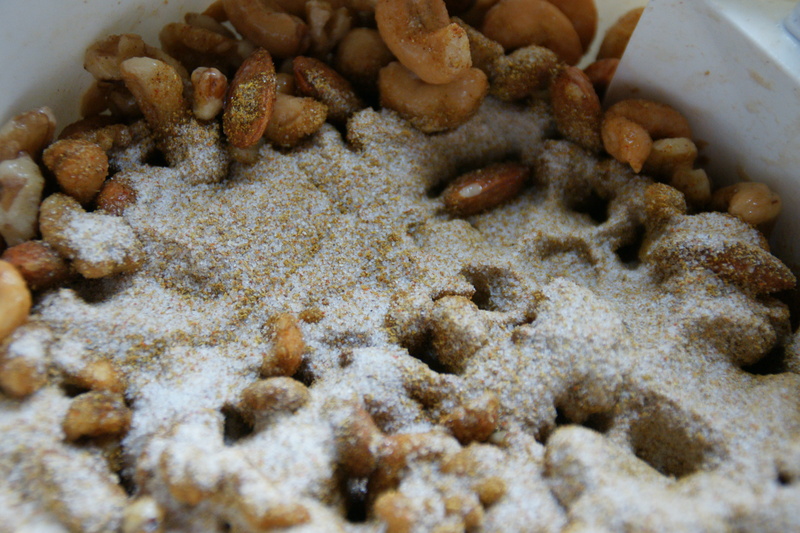 Add the nuts and toss with a rubber spatula. 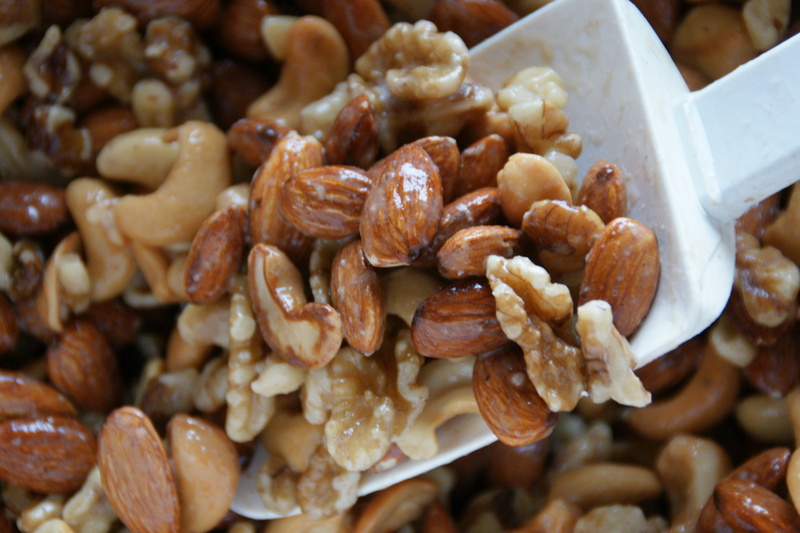 Make sure all the nuts are coated and shiny with egg white. Sprinkle on the sugar and spice mixture. Mix well to evenly coat the nuts. 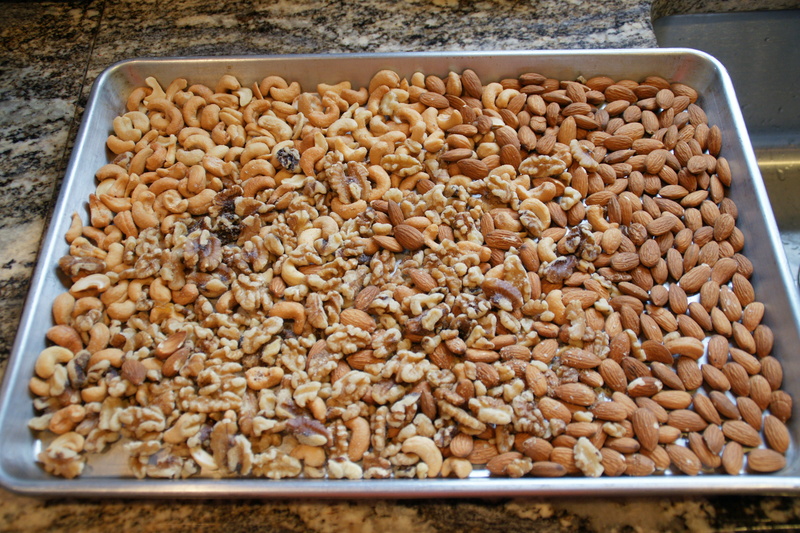 Spread the nuts on a rimmed baking sheet lined with parchment (or generously sprayed with oil). 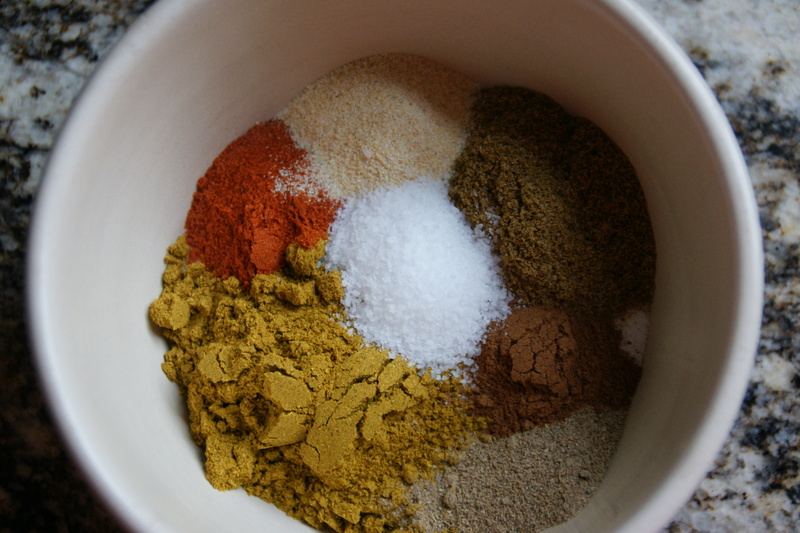 When the heat hits the spice blend– wow! 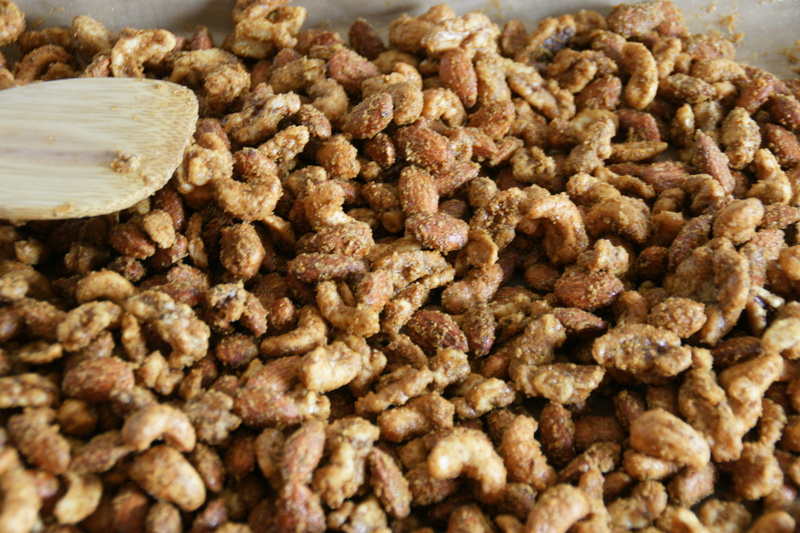 Bake until nuts are fragrant and coating has dried. 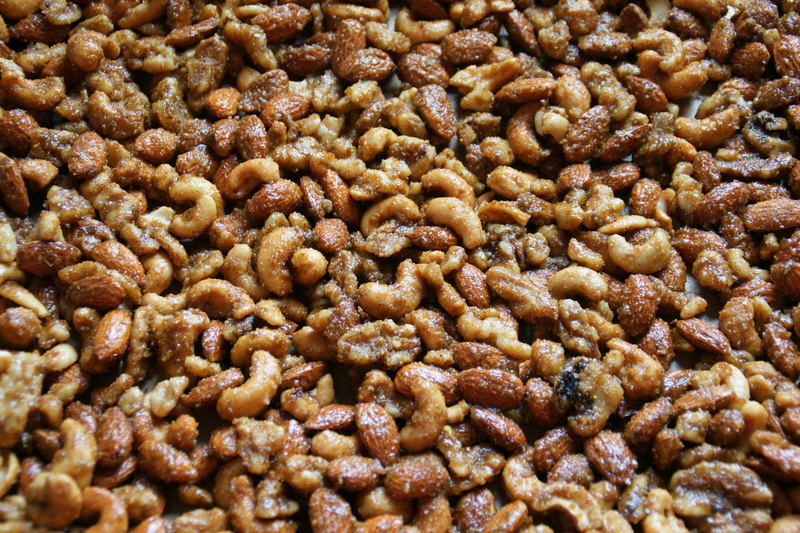 I let the nuts bake untouched for the first 45 minutes, then begin stirring every 10 minutes until the coating has caramelized. I will try this recipe but I’m not real sure about the curry, but I trust your judgement, so I’ll give it a whirl. Just happen to have a lot of nuts left over from holiday baking. I still have walnuts left so baklava is in my future! When you mix up the blend, start with half the curry and taste it! Love this recipe, I’m making it for the second time. Hope my sisters like it. Yeah! So addictive and different from your everyday cocktail nuts!